On September 9, Appalachia and America lost a true hero. The stalwart Larry Gibson, long-time champion for the mountains, died of a heart attack while working on his family's land at his beloved Kayford Mountain in West Virginia. We cannot begin to describe the sense of loss we feel at his passing, nor can we truly measure the depth of his impact on Appalachia's mountain treasures. 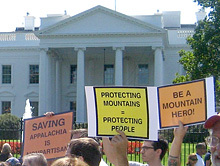 Larry's commitment to his principles, even in the face of adversity that included threats to his life, inspired thousands of people to join the fight to end mountaintop removal coal mining. In one of my favorite quotes attributed to Larry, he said, "Let me ask you this: What do you hold so close to your own circle of life that you would not put a price on it? 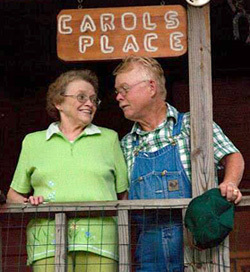 What would it be for you?… For me, it is the mountains and the people of Appalachia." For us, too, Larry. We will always remember your heroism, your unwavering defense of your homeplace, and your ability to spark our own resolve to stand up in the places where we live and fight for clean air, clean water, and our communities. Thank you. A public memorial service will be held for Larry on Sunday, October 14 from 2 to 6 p.m. at the Charleston Municipal Auditorium in Charleston, W.Va. (RSVP on the event's facebook page). This event will be preceded by the annual Changing of the Leaves Music Festival starting at 1 p.m. on Saturday, October 13 on Kayford Mountain. November 6 is Election Day -- Please remember to register to vote, and go to the polls to cast your ballot. The next issue of The Appalachian Voice will be exploring the topic of environment in education. How important do you think it is to include climate change, energy efficiency and other environmental topics in teaching our school kids? Looking for a green way to spruce up your home? Ambiance Interiors based in Asheville, N.C. is an award-winning, three-person design team with a penchant for reusing, recycling and other "conservation-minded" techniques. Oct. 4-5: The third-annual symposium integrates indigenous science with health and the environment to explore the consequences of mountaintop removal and other forms of extraction. Oct. 12-14: A weekend of education and solidarity including tours of mountaintop removal, service projects and community and expert panels, as well as live music and traditional dance! Oct. 13: The Keepers of the Mountains Foundation's annual family-friendly gathering honors American hero Larry Gibson. Music from 1 p.m. 'til dark, camping welcome. Oct. 14, 2-6 p.m.: Pay tribute to renowned activist Larry Gibson by uniting with family, friends, prominent activists, musicians, preachers and more.